Fellows hear from Martinbhai Macwan, the founder of Navsarjan, an AJWS partner working on Dalit rights. 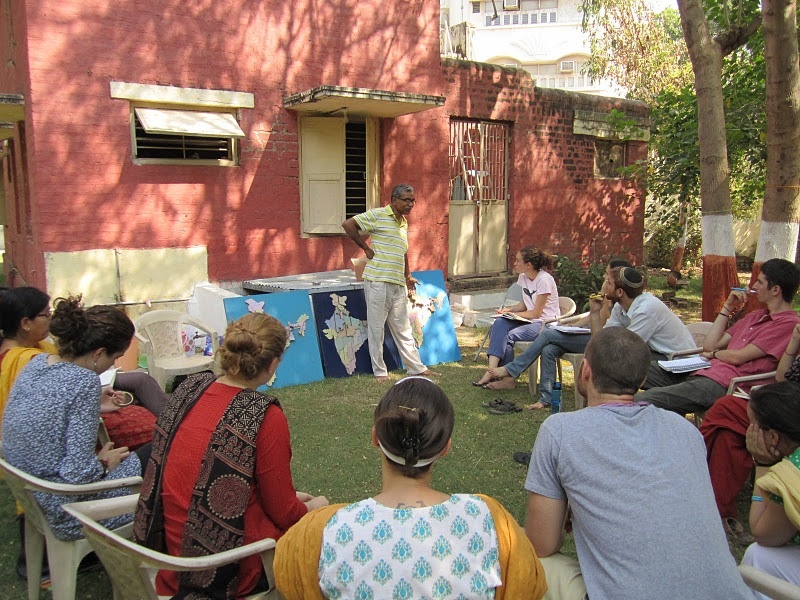 This month, in the Ashram where Mahatma Gandhi began India’s independence movement, AJWS’s World Partners Fellows begin their own journey of study and service in India. In a setting of simple living, fellows explore the mutual roots of Jewish belief and concepts of justice, human rights and service. Using AJWS’s curriculum, Live the Questions, fellows learn to move beyond good intentions to become responsible allies supporting the work of AJWS partners. 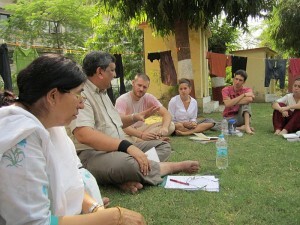 Through workshops and trainings, chavruta study and NGO-led community visits, Live the Questions brings the World Partners Fellowship orientation to life.Sixteen days into orientation with nine days remaining, fellows sit around the Ashram’s lawns for Hindi language training and discussions with Indian human rights leaders. They participate in daily reflection and study meant to foster what we refer to as “productive discomfort”—a pedagogy that eschews easy answers and asks fellows to sit with the difficult questions related to human rights work in the developing world. Fellows meeting with leading human rights defender, Gaganbhai Seti. Adalaj Stepwell and the temples of Palitana and meetings with NGO partners in the field. This week, fellows visit Vikalp’s women’s court and a Dalit leadership training center run by AJWS partner, Navsarjan. At the end of the month, before departing for their respective assignments, NGO partners join orientation for its final three days. Together they will participate in workshops on culture, service and relationship building. On November 25th, a day after Thanksgiving, they depart together for their respective sites in Maharashtra, Gujarat, Uttar Pradesh and Bihar. There, they will begin their year-long work on a spectrum of issues vital to India, including girls’ education; maternal health and reproductive rights; leadership development for Dalit youth; labor organizing for Kutch artisans; livelihood initiatives for women; and disaster mitigation for earthquake-prone areas in Gujarat and Bihar. To view photos from this month’s World Partners Fellowship orientation, please click here.